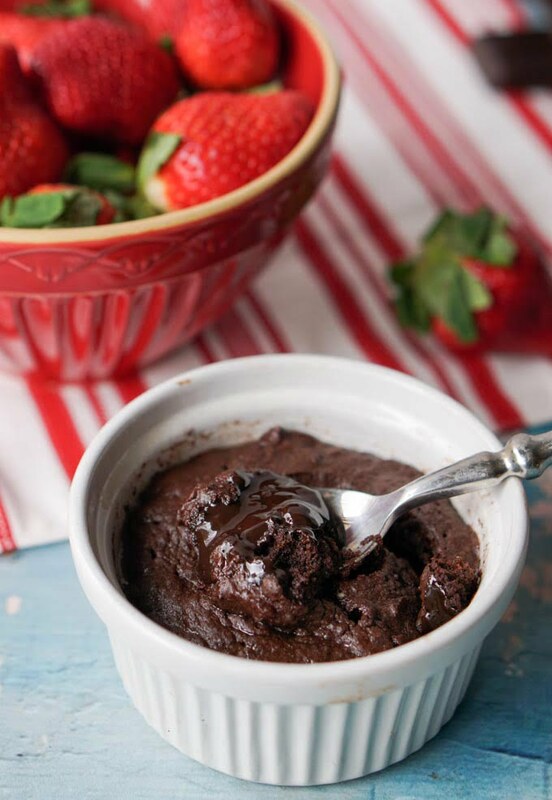 This low carb molten chocolate cake takes less than 5 minutes to make because you make it in the microwave. This easy, low carb dessert would be perfect for Valentine’s Day or when you have a chocolate craving. Only 4.9g net carbs. You might also love this low carb no bake raspberry cheesecake! I’m obsessed with mug cakes. I’ve been trying to make a good one for so long and I’ve finally did it! 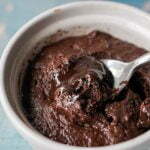 This low carb molten chocolate cake only takes about 5 minutes to make and tastes fantastic. It’s really chocolatey and the center is ooey and gooey. Best of all, you can make it in the microwave and it’s only 4.9g net carbs. I have to admit I’ve been making these a lot and now I’m moving on to a peanut butter one. I’ll keep you posted on that one. I have other mug cake posts on here like my 1 minute pumpkin muffin. That recipe is great for a quick breakfast or snack. But this one is much more decadent. One of the reasons it’s so gooey in the middle is that I put a piece of dark chocolate in the middle. I used the chocolate bar below that I buy at Aldi. The package contains 5 smaller bars and each of those has 6g net carbs. In this recipe I only used 1/4 of those small bars which is about 6-7 grams. That’s all you need. As a matter of fact you don’t even need that if you don’t have any. 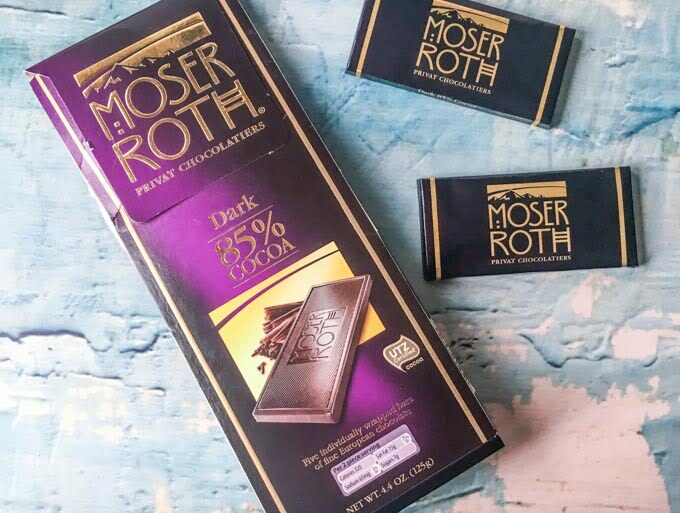 I love this low carb chocolate that I get at Aldi! One of the first batches I made I didn’t use the chocolate and you can see that pictured below on the left. It was still gooey in the center but not as much as the other one pictured on the right. When I make this now I usually make the one on the left to save a few carbs. You can decide which you prefer. The left one is without the chocolate bar and the right one is with. Both delicious!!! Add butter to a ramekin and microwave for 30 seconds. Add in the cocoa powder, Swerve sweetener, stevia and cream and mix well. Next add in the egg yolk and mix again. Take the piece of chocolate, break into littler pieces and press down in the center of the cake mixture. Microwave for 30 seconds and then let cool for a few minutes before eating. 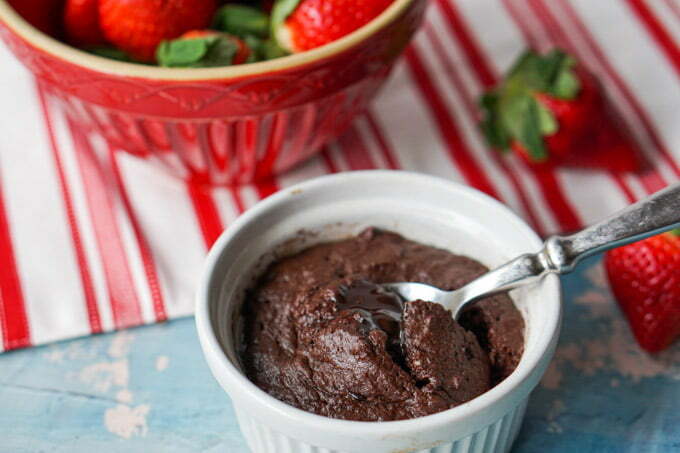 Low Carb Molten Chocolate Cake in the Microwave! If you would like to see some of my favorite baking products that I buy on Amazon, you can find them here along with other items I use for low carb cooking and baking. 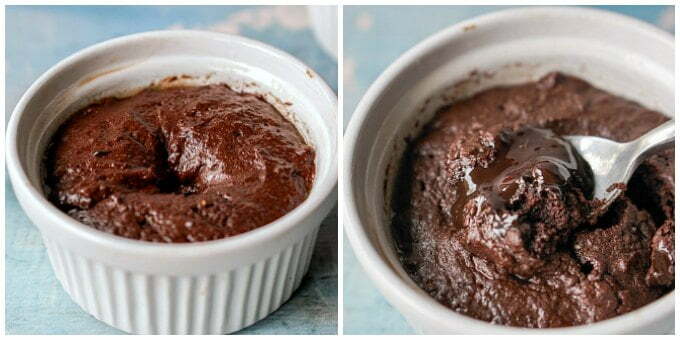 This low carb molten chocolate cake takes less than 5 minutes to make because you make it in the microwave. This easy, low carb dessert would be perfect for Valentine's Day or when you have a chocolate craving. Add in cocoa powder, Swerve sweetener, stevia, and cream. Mix well. Next add in egg yolk and mix well again. Take the small piece of chocolate and break into small pieces. Add to the center of ramekin and push in with finger. Microwave for 30 seconds. Let stand for a few minutes and then eat. The middle should be melty and the sides should be cooked. Do not cook for more than 30 seconds. ** I used a 1/4 of a bar of 85% cacao chocolate that I get at Aldi. See picture in post. If you are substituting another chocolate make sure it is low in carbs. You only need a little, tiny bit. You can also forgo this step completely and it will still be delicious. thank you so much for this fantastic recipe. Made it in microwave. Have the perfect texture and flavour and so easy to make. So glad you liked it! I was eating them everyday for awhile there. Thanks for coming back to comment… I appreciate it! I only have liquid stevia plain-not vanilla-will it make a big difference in the recipe and taste? Is there something I can substitue? like add more Swerve and use vanilla extract 10 drops? Hi Cheryl, I don’t think it will matter much. You can add a little vanilla extract if you want but I wouldn’t sweat it. I just love that vanilla stevia as it seems to take a little of that bitterness that stevia usually has. But honestly it won’t make much of a difference if you just use plain. Good luck! Thanks so much for letting me know! I make these things and I really like them but I never know if others will. I just made a pumpkin version similar to this and it is goooood! Ill be posting it soon so if you like pumpkin you will like this one too. Fantastic recipe. The mug works great. Easy. Delicious. Really delicious. And I’ve made quite a few of these keto mug cakes, and this one is undoubtably my favorite. So glad you like it! Thanks for taking the time to comment! So delicious and so tempting to make all the time. I love those mini bars in a bar from Aldi. I love those mini bars too! Thanks for taking the time to comment! I love easy desserts and I hate them at the same time. It tempts me to make and eat them. That chocolate molten cake looks too good to be true. Ooey, gooey and chocolatey at the same time. Just hand me a huge spoon. I know what you mean Marisa! A love/hate affair! Oh wow this sounds so good! I love molten chocolate cakes and the low carb makes it so tempting to make it all the more often! I love microwave cakes..! So easy, no left over and so quick. But the best part I love warm cakes especially with ice cream so often I like making a quick microwave cake with ice cream..This look so good. yum! I absolutely love mug cakes too. Sometimes I’m craving for cake and baking a regular sized one is just not practical. I have my favourites but I haven’t found a chocolate recipe that I love yet. I think this will be it! So gooey and chocolatey!! I love easy desserts. This looks like a chocolate lovers dream (like my hubby). What a great way to whip up a special treat any time you like….maybe a little too easy (LOL). In like I would be making this ALL the time. Haha I know what you mean Gloria. I was making 1 a day for a while there “trying to get the right taste” haha! Guess what I am going to make tonight!!! I ate so many of them last week LOL! If I don’t have a ramekin, what do you suggest I use instead? Any microwaveable bowl that’s about 2 cups. You can try a mug though I have not tried that yet. I like the ramekins because they are wide and shallow. I’m going to go make one in a mug and let you know how it goes! I worked fine. It doesn’t rise very much but it tastes great. I made it without the chocolate bar and it was still nice and gooey inside. Good luck!